The question of whether someone should own a pet is never as simple as whether that pet has a measurably beneficial or detrimental effect on the owner's physical health. The emotional bond between owner and pet can be as intense as that in many human relationships and may confer similar psychological benefits. Death of a pet can cause grief similar to that in human bereavement, whereas threat of loss of a pet may be met with blunt refusal and non-compliance with advice on health. We examine the current evidence for a link between pet ownership and human health and discuss the importance of understanding the role of pets in people's lives. Is pet ownership associated with human health? Research dating from the 1980s popularised the view that pet ownership could have positive benefits on human health. Benefits ranged from higher survival rates from myocardial infarction1; a significantly lower use of general practitioner services (prompting some researchers to speculate on considerable potential savings to health expenditure)2; a reduced risk of asthma and allergic rhinitis in children exposed to pet allergens during the first year of life3 4; a reduced risk of cardiovascular disease5; and better physical and psychological wellbeing in community dwelling older people.6 No studies have found significant social or economic differences between people who do or do not have pets that would adequately explain differences in health outcome, leading to the belief that pet ownership itself is the primary cause of the reported benefits. Do we need a broader definition of health? The main issue may not be whether pet ownership per se confers measurable physical benefits but the role that pets have in individual people's lives—namely, the contributions of the pet to quality of life or the costs to wellbeing through a pet's death. This issue embraces a broader definition of health that encompasses the dimensions of wellbeing (physical and mental) and a sense of social integration. 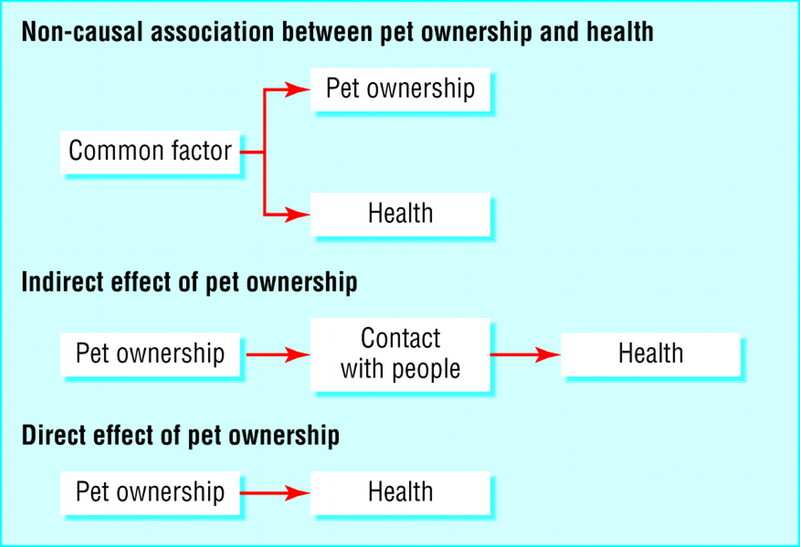 Three potential mechanisms have been proposed to explain the association between pet ownership and benefits to human health (fig 1).13 The first is that there is no real association between the two, rather that cofactors such as personality traits, age, and economic or health status impact on the decision to own a pet and thus produce an apparent link between pets and health. So far, however, evidence is lacking that any of these cofactors account for both health promoting attributes and propensity to own pets, suggesting that health benefits, when reported, may be attributable to some aspect of pet ownership. The loss of a pet may be particularly distressing for owners if it was linked with a deceased spouse or if it offered companionship or social contact with people.18 For these reasons many people may appreciate help and advice on how to manage a pet in the event of a health problem in the family. People do not own pets specifically to enhance their health, rather they value the relationship and the contribution their pet makes to their quality of life.20 Greater understanding among health professionals is needed to assure people that they do not need to choose between pet ownership and compliance with health advice. Contributors and sources JMcN has special research interests in the influence of pet ownership on health and lifestyle. She was formerly based at the University of Warwick. Her current work is with Dogs for the Disabled, the Society for the Protection of Animals Abroad, and Cats Protection, UK. She is a member of the Society of Companion Animal Studies. AG gained his doctorate from the University of Warwick, researching the role of pets in the alleviation of loneliness. AR and SA are members of the Society of Companion Animal Studies. J-AD has a degree in psychology and is director of the Society of Companion Animal Studies. EO is chairwoman of the Society of Companion Animal Studies. References refer to primary sources located through MIMAS web of knowledge service/web of science records. JMcN wrote the article, with contributions from the other authors, and is guarantor. Competing interests JMcN received a research award, 2000-2, from Masterfoods UK to investigate the role of pets in children's health. AG was employed as a research assistant at University of Warwick, 1999-2003, funded by Waltham Centre for Animal Nutrition.
. Animal companions and one year survival of patients after discharge from a coronary care unit. Public Health Rep 1980; 95: 30712.
. Health benefits and health cost savings due to pets: preliminary estimates from an Australian national survey. Soc Indic Res 1998: 111.
. Exposure to dogs and cats in the first year of life and risk of allergic sensitization at 6 to 7 years of age. JAMA 2002; 288: 96372.
. Exposure to pets and atopy-related diseases in the first 4 years of life. Allergy 2001; 56: 30712.
. Pet ownership and risk factors for cardiovascular disease. Med J Aust 1992; 157: 298301.
. Influence of companion animals on the physical and psychological health of older people: an analysis of a one-year longitudinal study. J Am Geriatr Soc 1999; 47: 3239.
. Pets and the development of allergic sensitiziation. Curr Allergy Asthma Rep 2005; 5: 21220.
. Advances in environmental and occupational diseases 2004. J Allergy Clin Immunol 2005; 115: 1197202.
. Symptoms of asthma and the home environment. The ISAAC I and III cross-sectional surveys in Munster, Germany. Int Arch Allergy Immunol 2005; 137: 5361.
. Pet ownership and risk factors for cardiovascular disease: another look. Med J Aust 2003; 179: 4668.
. The impact of pet ownership on health and health service use: results from a community samples of Australians aged 40 to 44 years. Anthrozoos 2003; 16: 4356.
. Pet ownership and health in older adults: findings from a survey of 2551 community based Australians aged 60–64. Gerontology 2005; 51: 407.
. The benefits of pets for older people: a review. In: Dono J, Ormerod E, eds. Older people and pets: a comprehensive guide. Oxford: Society for Companion Animal Studies Publications, 2005.
. Dogs as catalysts for social interactions: robustness of the effect. Br J Psychol 2000; 91: 6170.
. Dogs for the disabled: benefits to recipients and welfare of the dog. Appl Anim Behav Sci 1998; 59: 4960.
. Social relationships and health. Science 1988; 241: 5404.
. A theoretical basis for health benefits of pet ownership: attachment versus psychological support. In: Wilson C, Turner D, eds. Companion animals and human health. Thousand Oaks, CA: Sage, 1998: 10522.
. The end of a relationship: coping with pet loss. In: Robinson I, ed. The Waltham book of human-companion animal interactions. Oxford: Pergamon Press, 1995: 12743.
. Pet-assisted therapy in the nursing home setting: potential for zoonosis. Am J Infect Control 2001; 29: 17886.
, eds. Companion animals and us. Cambridge: Cambridge University Press, 2000.